Glenn Strange has a true passion for making people laugh and helping them discover the hidden humor in their everyday lives. 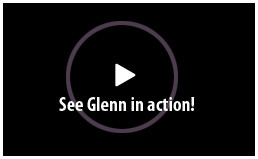 With constant audience feedback like, “This was the best one ever,” Glenn has become one of the most popular keynote comical entertainers for the corporate and the association market today. Years ago he started as a weekend birthday party magician. To this day Glenn is haunted with memories of sugar overdosed children kidnaping his magic props, the twelve long hours he spent in a hot humid Chick-fil-A chicken costume, and the birthday mom that dressed as a Big Blue Clown, scooped ice cream, and talked as a smoldering Virginia Slim cigarette bounced up and down in her blue lips. Let Glenn bring laughter and praises to your next event with his hilarious true stories and his one of a kind audience interactive program. A comical experience that’s 100% clean and respectful. Don’t miss this opportunity to laugh and be inspired.